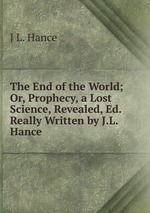 Аннотация к книге "The End of the World; Or, Prophecy, a Lost Science, Revealed, Ed. Really Written by J.L. Hance"